Takko Tuesday! - The Yellow Ribbon - Polish Etc. I am sure it is still Tuesday somewhere! I was able to scare another older Takko Lacquer polish in a destash sale. This is great because I am running out of Takkos to share on Takko Tuesday. We should have some new takkitos popping up soon though. "The Yellow Ribbon" was originally released last summer exclusive to the A Box, Indied. It was the very last A Box, Indied to be released which made it extra special. I mean...we all know it was extra special because it had a Takko in it, too. "The Yellow Ribbon" is a banana yellow jelly/crelly polish with multiple sized gold holographic glitters and a fine golden microflakie shimmer running throughout. 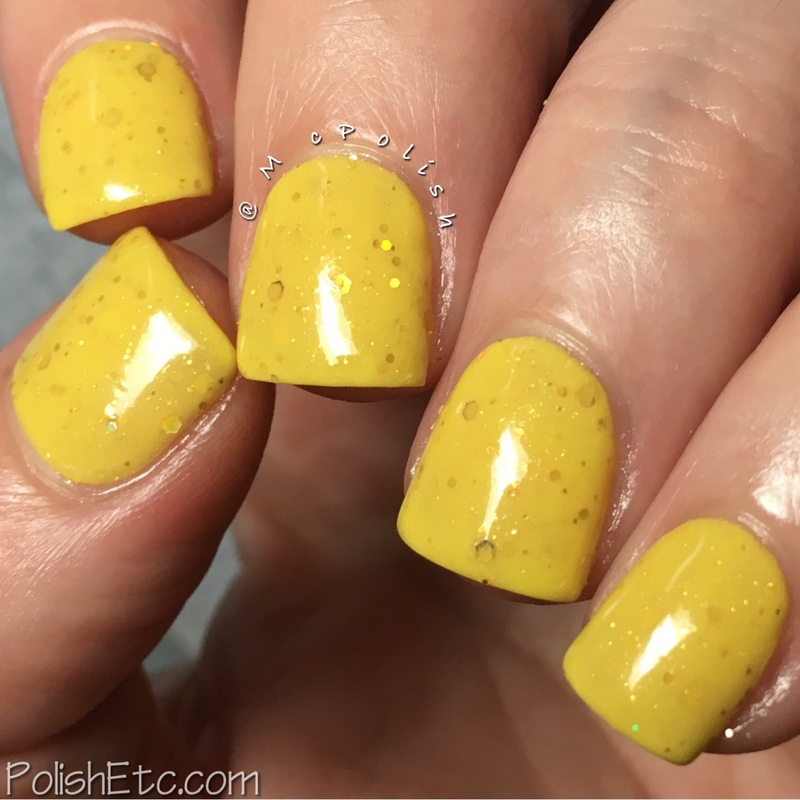 The formula was surprisingly good for a yellow jelly/crelly polish! Yellow shades are traditionally a pain when it comes to streaking but this one applied very smoothly. I am showing you three coats with glossy top coat here. Since this shade will not be available for purchase anymore, you will need to hunt it down in destash sales like I did. With it being a yellow polish, you have a better chance of finding it because they are usually not everyone's cup of tea. Good thing I like yellow! Takko Lacquer will be having a restock this Friday, July 21st. The Gems and Crystals Collection will be available along with some older polishes. Happening at 8pm EST!! There are so many Takko shades I never saw before :) Great color!